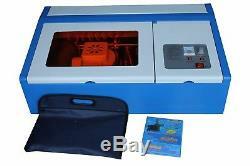 CO2 Laser Engraving Machine with Clamp Kit. This brand new CO2 laser engraver is suitable for various materials, such as mylar stencil material, bamboo piece, double-color planks, rubber plate, boulder, horns, leather, crystal, wood, organic plastic, abrics, paper , film, canvas , rubber stamp material, Acrylic and Plastics. 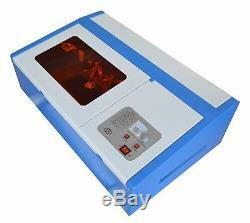 The Computerized Mini Laser Engraving and Cutting Machine is equipped with one 40W water cooling laser tube, high precise stepping motors, high quality control board. This machine employs an USB port and thus can be connected to your laptop or desktop. You can output data directly from coredraw software WinsealXP, LaserDRW Don't support MOSHI Draw. This machine can work well with multiple graphic formats including EMF/JPG/PLT/WMF. According to the thickness of the material, the laser head can adjust focus moved up and down, to achieve the optimal carving (cutting), range of adjustment is 0-0.7 (1.8 cm). Certification (FDA, CE, ISO9001) USB Port to Computer CorelDRAW LASER-Software. Directly output data from CorelDraw software. Your computer should install orconfigure the CorellDraw Software. Reinforced and thickened machine body make transportation absolutely to be safer and longer life time. Built heat dispersed fan to reduce all electronic component's temperature Adopt Japan imported advanced motherboard and microchip to make engraving high speed, high accuracy, and machine long-life. Adopt Germany imported bearing and high accuracy stepping belt which not only make the engraving more precise, also make the machine life time twice to three times than ordinary CO2 LASER Engraver. Support multiple graphic formats including BMP/JPG/JPEG/WMF/EMF/PLT. Engrave almost anything on almost any surfacen videos. Maximum Item Size to Engrave. 8.75"x10.25"x2.85 (22x26x7cm). 0.04 X0.04in (1mm X 1mm). 0.001 in (0.026mm) / (1000dpi). 110V/60Hz for USA, Canada, Japan etc. 220V250V for other countries all over the world. 0.0004 in (0.01mm). MoshiDRAW software (both NewlyDraw and NewSeal function). BMP / JPG / JPEG / WMF / EMF /PLT. Laser Tube, Focal lens, Reflection lens. 37.8"x25.2"x15.7 (96x64x40cm). Explanation of the control panel. Using this button to adjust the electric current output. MA : refers to actual output electric currnet of the engraver. After pressing the button , the laser switch be pressed before each engrave , otherwise the laser will not shine. Master switch for controlling engraver. At right side of the engraver , the port will connect relevant port on the computer through printing cable. Keep the lens clean prevent the carving material from burning. It is for the circulation of cooling water. To lengthen the service life of the laser tube , purified water is to promoted. At the hinder of the engraver and used for the installation of exhaust fan. The fan must be correctly installed for the cleanness of the machine. This machine is suitable to seal engraving, advertisement, art gift, garment, leather, toy, building upholster, computerized embroidery, packing and printing, paper product, garments sampling, large width tailoring, shoemaking, furniture, industry, craftwork, nameplates decorations, woodcut and other industries. Acrylic is the most popular material to engrave using a laser system. It engraves and cuts very easily, comes in a wide variety of shapes and sizes, and can be relatively inexpensive. Acrylic comes in two forms, cast and extruded. 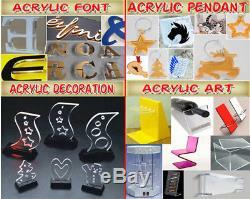 Cast acrylic is used for almost all engraving purposes. This is because the frost produced provides a nice white contrast against the clear material. Extruded acrylic remains clear when engraved but does not produce an adequate contrast. However, extruded acrylic is ideal if you are going to vector cut only. Extruded acrylic is less expensive than cast and also has a lower melting point. The lower melting point produces an edge that looks flame finished when cut. Double-color plastic sheet is a kind of materials for engraving, which is widely applied to production of signboard, lighting advertising board, gift arts, information board, interior decoration and so on. The main processing way for double-color plastic sheet cover cutting, sawing, carving, gilding, laser-treating, bending and bonding. Wood engraving has been used widely in our life. It is very easy using the laser to produce sophisticated inlay work on wood, mother-of-pearl or even plastic. Veneers may be cut to size with special accuracy using the laser. The great advantage lies in the precision of the cut parts and also the controllability of the CAD or graphics programs. Positive and negative parts may be cut in very thin materials without correcting the cutting width. Mylar Airbrush Stencil Material Engraving. 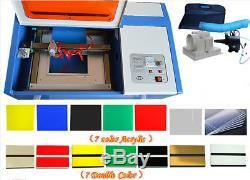 It's a kind of substrates to be cut by cutting plotter to form all kinds of figures and graph. The stencils are reusable, it can be used for T-shirt, wall, artwork, human body, and automotive applications. It is made of Mylar. This rubber plate is made of two layers ofnatural rubber, can be cut by laser engraver to make stamp for commercial andpersonal use, especial for printing factory to print cartons and other packageboxes. Pay attention: Please set up mirror image when carving patterns. Red Rubber Stamp Material Engraving. Rubber stamping is quite simply the process of transferring and replicating an image. Using a variety of inks and other mediums, the image on the stamp can be transferred onto a huge range of objects, transforming the ordinary into something special. Rubber stamps have been used widely now, our laser engraving machine can make a wonderful rubber stamp, which maybe start your new business. 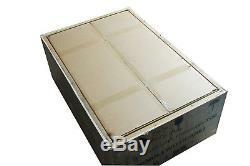 Rubber Sheet for Laser Engraver Engraving Stamp. This rubber plate with A4 size 2.3mm thicknes natural rubber, can be cut by laser engraver to make stamp for commercial and personal use. Smooth surface for quality results, easy cutting and engraving Suitable for finer sized prints, having a fine ink loading, precise printing Chemical, oil, abrasion resistance. 11.6"x8.26"x0.09/297x210x2.3mm. Self-Inking Rubber Stamp Holder and Inkpad. Self-Inking Rubber Stamp works greatly and simply. We custom date, address, images and so on for you. Self Inking rubber stamp is for use in regular paper not for glossy papers. Use laser engraving machine, you can DIY all kinds of self ink rubber stamp. Sturdy and durable, saving cost 2. Mark clearly, improve image 3. Convenient fuel injection, easy to carry 4. Panoramic window, precision positioning, increase efficiency 5. Custom date, address and all kinds of images to meet your needs Printing. All our equipments are perfectly packaged by high-strength five-layer corrugated carton, inside withstandard soft and hard foam and three-ply board, all metal parts are separately packaged, which guarantees product safety during transportation. 1Sheet 23.6"x11.8" (600x300mm) Double Color Plank-Red on White (133020) 1Sheet 23.6"x11.8" (600x300mm) Double Color Plank-Green on White (133021) 1Sheet 23.6"x11.8" (600x300mm) Double Color Plank-Black on White (133022) 1Sheet 23.6"x11.8" (600x300mm) Double Color Plank-blue on White (133028) 1Sheet 23.6"x11.8" (600x300mm) Double Color Plank-orange on White (133029) 1Sheet 23.6"x11.8" (600x300mm)Double Color Plank-White on dark blue(133031) 1 Sheet 23.6"x11.8"x0.12" (600x300x3mm) Transparent Acrylic Panel (133001) 1 Sheet 23.6"x11.8"x0.12" (600x300x3mm) Red Acrylic Panel (133002) 1 Sheet 23.6"x11.8"x0.12" (600x300x3mm) Green Acrylic Panel (133003) 1 Sheet 23.6"x11.8"x0.12" (600x300x3mm) Blue Acrylic Panel (133004). Usually you will wait 5-7 days after checkout for it to clear. The item "40W K40 Mini CO2 Laser Stamp Engraving Cutting Machine Laser Engraver Cutter USB" is in sale since Sunday, December 17, 2017. This item is in the category "Business & Industrial\Printing & Graphic Arts\Screen & Specialty Printing\Engraving". The seller is "eezglobal" and is located in Tampa, Florida. This item can be shipped to United States.